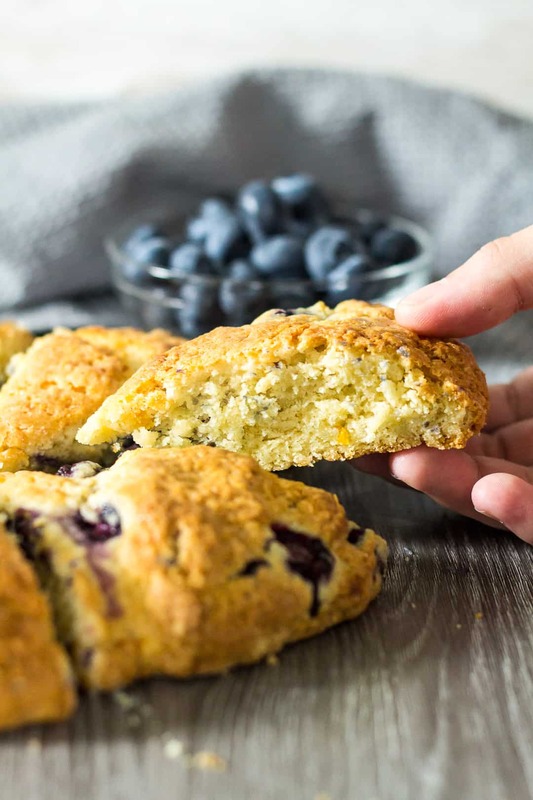 Blueberry Orange Scones – These orange-infused scones are deliciously soft on the inside, crispy on the outside, and stuffed full of fresh blueberries! Today, I bring you another delicious scone recipe that will go perfectly with your hot cup of tea or coffee on these warm summer mornings. 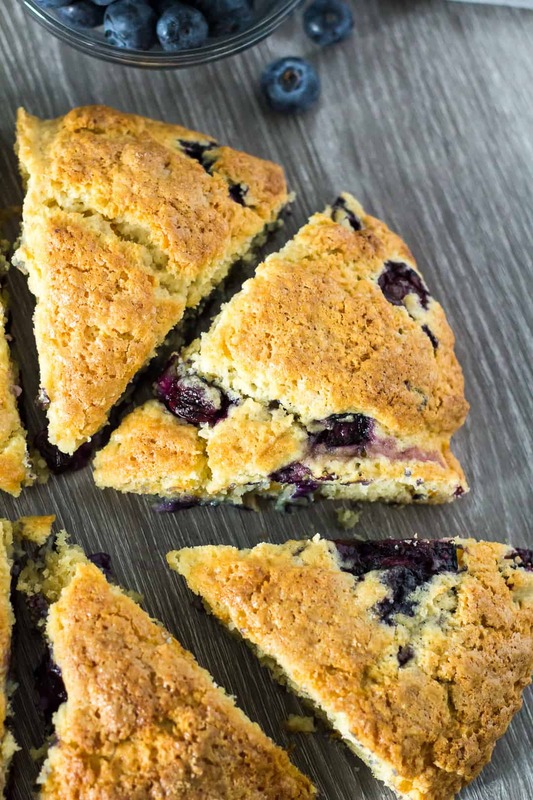 I’ve already brought you these Lemon Drizzle Scones, and my favourite Chocolate Chip Scones, and now you can add these Blueberry Orange Scones to your breakfast table! 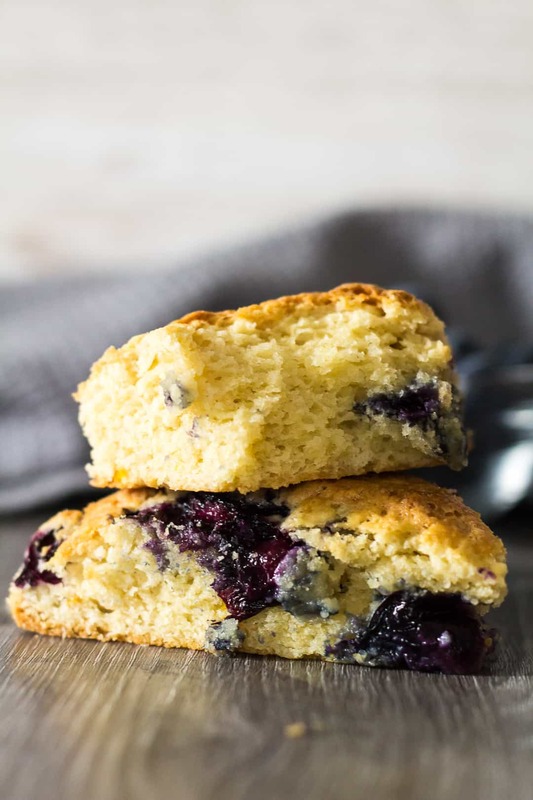 These scones are crunchy on the outside and super soft on the inside, infused with orange zest, and loaded with fresh blueberries. Top with a sweet orange glaze if desired. Unsalted butter: Cut the butter up into cubes and keep refrigerated until ready to use. Heavy cream (double cream): You’ll need 120ml for the scones, and some extra to brush on top of the scones before baking. Blueberries: I used fresh blueberries, but you may use frozen blueberries. Orange juice: Juice from the orange you used for the zest. 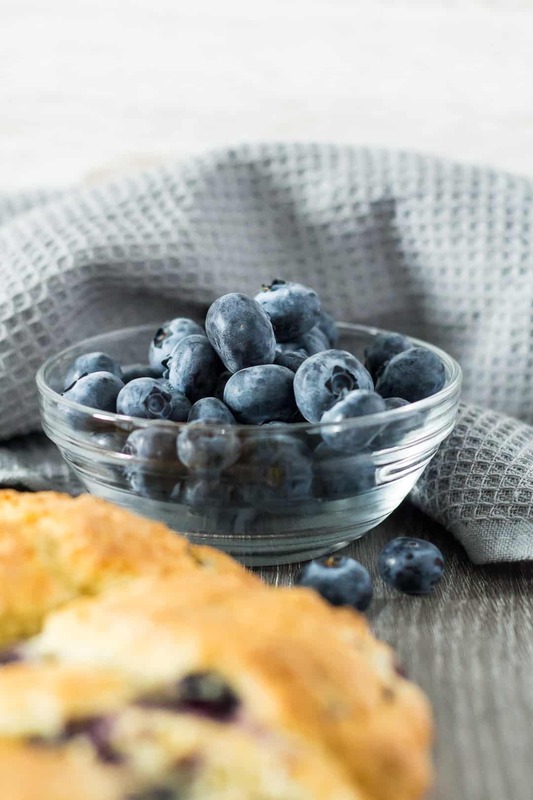 Simple, basic ingredients are all you need for these blueberry orange scones. They are also super quick and easy to throw together! In a large bowl, whisk together the flour, sugar, baking powder, salt, and zest. Add the butter and, using a pastry cutter, fork, or your fingertips, work it into the mixture until it resembles coarse breadcrumbs. You can use a food processor for this step. In a jug, whisk together the heavy cream, egg, and vanilla. Add to the flour mixture, and mix together until a soft dough starts to form. Gently fold in the blueberries. Turn the dough out onto a lightly floured surface, and shape into an 8-inch round disc. Transfer to a baking tray lined with parchment paper or a silicone mat, cut into 8 wedges, and pull the triangles slightly away from one another so they are not touching. Lightly brush each scone with heavy cream, then bake for 20 – 25 minutes or until golden brown and cooked through. Allow the scones to cool slightly whilst making the glaze. The glaze is optional but if you are using, simply whisk together the icing sugar and orange juice until smooth and combined. Drizzle over warm or room temperature scones, and enjoy straight away! Scones are best served on the day they are made, but they keep fresh in an airtight container at room temperature or in the fridge for up to 2 days. They also freeze well for up to 3 months. If you are storing the scones, I would top them with the orange glaze just before they are being served. Try these delicious breakfast recipes next! 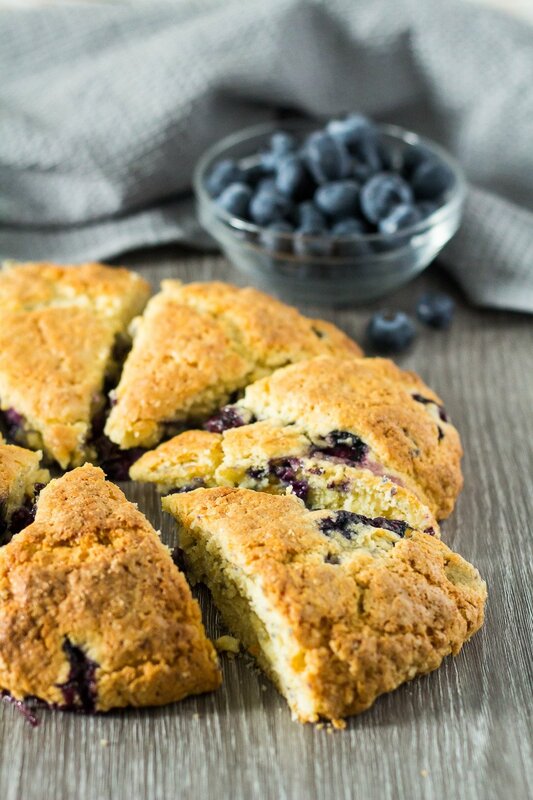 These orange-infused scones are deliciously soft on the inside, crispy on the outside, and stuffed full of fresh blueberries! Add the butter and, using a pastry cutter, fork, or your fingertips, work it into the mixture until it resembles coarse breadcrumbs. You may also use a food processor. In a separate bowl or jug, whisk together the egg, heavy cream, and vanilla until combined. Add to the flour mixture and gently mix in to form a soft dough. Do not overmix. Gently fold in the blueberries. Turn the dough out onto a lightly floured surface, and shape into an 8-inch round disc. Transfer to the prepared baking tray, cut into 8 wedges, and pull the triangles slightly away from one another. Whisk together the icing sugar, and orange juice until smooth and slightly runny. Add more juice if the glaze is too thick, or more icing sugar if too runny. Drizzle over warm or room temperature scones, and enjoy! Scones are best served on the day they are made, but leftovers can be kept in an airtight container at room temperature or in the fridge for up to 2 days. They also freeze well for up to 3 months. Thaw overnight in the fridge before serving. 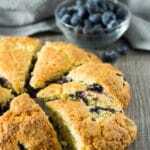 This is a delicious flavor combination and scones are huge with my family, especially for tea time ! I would never have thought of pairing blueberry and orange together, but the flavors work together so well! The dough was a little sticky and hard to handle, but the scones were absolutely DELICIOUS! Totally worth the initial stickiness. My husband said, “I love the texture. They are crunchy on the outside, moist on the inside. I love them.” Thank you for the recipe!